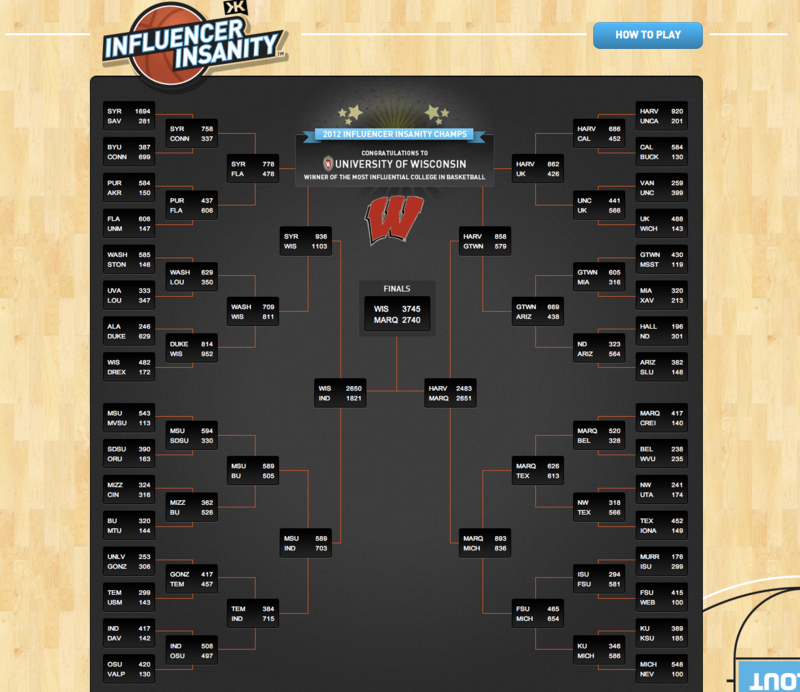 Klout, the self-proclaimed and often debated Standard of Influence just took March Madness to a whole new level. It has been suggested that some schools are more influential than others. Well, what better way to settle that debate than by a bracketed tournement of champions hosted by the site that has done the best job thus far of measuring the influence of users in the social media realm? I give you, Influencer Insanity! Don’t Scream It, +K It! While I am still trying to figure out exactly how much a +K helps your Klout score, it is clear that a +K is a vote of support in the Klout world. Much the same way that Klout is a popularity contest, +K’s are like a vote for you to become prom king, at least in a certain realm. So, when it came time to vote for the most influential school, why wouldn’t Klout use their easily understood +K function? Why Influencer Insanity is Genius! This tournement of Influencer Insanity could introduce Klout to more college students (and alumni) and form the habit of +K’ing things. Based on a previous #KloutChat, I know that I’m not the only one who sees a day when a +K button will appear on brand pages so that users can vote for Nike to be considered more influential on Athletic Apparel. Could this +K challenge, March Madness ripoff be something more than just another marketing ploy in social media? I think so. This is part of the foundation for a more influence-measured tomorrow. After reading that, is it so far-fetched to see a day when companies who already look at Klout will look to this tournament as a doorway into the possibilities of Klout? Audi and other brands have already started using Klout scores to gauge who to give Klout Perks and coupons to. Why wouldn’t they use this platform to reestablish (or establish) their dominance in an area. Why wouldn’t Audi, a brand that has made great strides in North America over the last 10 years, use their partnership with Klout to try and take down BMW and Mercedes? Why wouldn’t K-Swiss, a company whose latest campaign with 72 and Sunny (Read my Kenny Powers is Marketing F@cking Genius) take a chance to poke a little hole in the armor of Adidas, Under Armour and Nike? I would. The bottom-line, I think that Influencer Insanity is just the beginning of the Madness to come. Well done, Klout.